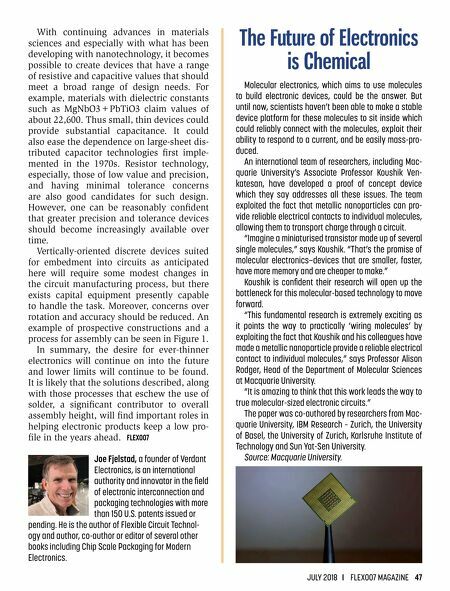 JULY 2018 I FLEX007 MAGAZINE 47 With continuing advances in materials sciences and especially with what has been developing with nanotechnology, it becomes possible to create devices that have a range of resistive and capacitive values that should meet a broad range of design needs. For example, materials with dielectric constants such as MgNbO3+PbTiO3 claim values of about 22,600. Thus small, thin devices could provide substantial capacitance. It could also ease the dependence on large-sheet dis- tributed capacitor technologies first imple- mented in the 1970s. Resistor technology, especially, those of low value and precision, and having minimal tolerance concerns are also good candidates for such design. However, one can be reasonably confident that greater precision and tolerance devices should become increasingly available over time. Vertically-oriented discrete devices suited for embedment into circuits as anticipated here will require some modest changes in the circuit manufacturing process, but there exists capital equipment presently capable to handle the task. Moreover, concerns over rotation and accuracy should be reduced. An example of prospective constructions and a process for assembly can be seen in Figure 1. In summary, the desire for ever-thinner electronics will continue on into the future and lower limits will continue to be found. 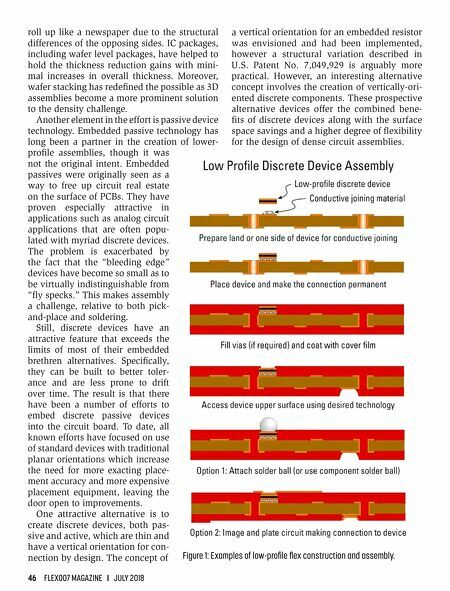 It is likely that the solutions described, along with those processes that eschew the use of solder, a significant contributor to overall assembly height, will find important roles in helping electronic products keep a low pro- file in the years ahead. FLEX007 Joe Fjelstad, a founder of Verdant Electronics, is an international authority and innovator in the field of electronic interconnection and packaging technologies with more than 150 U.S. patents issued or pending. He is the author of Flexible Circuit Technol- ogy and author, co-author or editor of several other books including Chip Scale Packaging for Modern Electronics. The Future of Electronics is Chemical Molecular electronics, which aims to use molecules to build electronic devices, could be the answer. But until now, scientists haven't been able to make a stable device platform for these molecules to sit inside which could reliably connect with the molecules, exploit their ability to respond to a current, and be easily mass-pro- duced. An international team of researchers, including Mac- quarie University's Associate Professor Koushik Ven- katesan, have developed a proof of concept device which they say addresses all these issues. The team exploited the fact that metallic nanoparticles can pro- vide reliable electrical contacts to individual molecules, allowing them to transport charge through a circuit. "Imagine a miniaturised transistor made up of several single molecules," says Koushik. "That's the promise of molecular electronics—devices that are smaller, faster, have more memory and are cheaper to make." Koushik is confident their research will open up the bottleneck for this molecular-based technology to move forward. "This fundamental research is extremely exciting as it points the way to practically 'wiring molecules' by exploiting the fact that Koushik and his colleagues have made a metallic nanoparticle provide a reliable electrical contact to individual molecules," says Professor Alison Rodger, Head of the Department of Molecular Sciences at Macquarie University. "It is amazing to think that this work leads the way to true molecular-sized electronic circuits." The paper was co-authored by researchers from Mac- quarie University, IBM Research – Zurich, the University of Basel, the University of Zurich, Karlsruhe Institute of Technology and Sun Yat-Sen University. Source: Macquarie University.